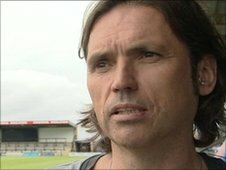 Forest Green shareholders have voted for a process that makes it easier for chairman and majority shareholder Dale Vince to invest more cash in the club. Vince told BBC Gloucestershire: "It's about flexibility. It gives the board the ability to issue shares throughout the year without calling a meeting." Vince came to the New Lawn last August when the club was still part-time. "We came in at a tough time, we've put a lot of things straight and we can see the light at the end of the tunnel." Rovers currently sit just above the relegation zone in the Blue Square Bet Premier having been full-time since November following Vince's investment in the club. "I see a great future and when you push all the problems to one side it's a privilege to be here," said Vince. "There wasn't a lot of time to do 'due diligence' because it was a bit of an emergency. We jumped in with both feet but I don't think I'd have done it differently." Vince has made his name as the founder of green energy company Ecotricity. "Off the field the aim is to break even. I think we can do that in a season and a half. On the pitch it is to raise the level of football and chase promotion, and then it's also about the eco-message and to really 'green' the place up. With all three of those things, next season should be a cracker. "Relegation would not be the end of the world. We won't change our plans or the playing budget. We've signed a bunch of players already and it would be a small step backwards before taking a big jump forwards."